PORTLAND, Ore. -- Earlier this week, globs of black, powdery pollution spread across the Columbia River near Longview, Wash. The mile-long spill, first spotted Tuesday morning, turned out to be floating petroleum coke, an estimated 25-pounds worth, according to the U.S. Coast Guard. While the relatively small dump of industrial material likely didn't directly harm fish or wildlife, it's probable source is a company that has a long record of running afoul of rules protecting clean air and water. And an area environmental group says the spill shows a state agency needs to crack down on the company. The 416-acre Chinook Ventures port facility that spill investigators are focusing on is already the source of a lawsuit. A Cowlitz County community group recently formed to oppose its presence, and Washington state regulators have known for years it is flouting federal air and water protection rules. Now, this most recent spill has focused new attention on the Longview-based company and the agency responsible for policing its pollution, the Washington Department of Ecology. "The news of any spill on the Columbia is disturbing," Hood River-based Columbia Riverkeeper wrote to Washington Gov. Chris Gregoire on Wednesday. "The facts that are coming together in this particular matter raise grave questions about Ecology's enforcement of environmental laws and protection of the Columbia River." In response to a request from The Oregonian, Chinook Ventures issued a statement this week saying the cause of the spill is still under investigation. "We are obviously very concerned with the matter and are working with the government agencies to determine the source of the release," the statement said. The site the company now operates was for decades home to an aluminum smelting facility that ceased operations in 2003. Chinook Ventures is developing it as a commercial port, and has said it will clean up environmental damage on about 100 acres. While the company is operating under a permit intended for smelting operations, it's already using the land to import and export petroleum coke, or petcoke, a carbon-rich byproduct of oil refining used for fuel. Washington state began asking the company four years ago to submit an application for the appropriate permit, and has repeated that request again and again. Then last year the state fined the company $150,000 for a litany of environmental impacts. "Ecology has received numerous complaints about Chinook Ventures, and combined with what we've seen, we're deeply concerned," Laurie Davies, the department's manager for the program that oversees permitting for Chinook Ventures, said at the time. A bulleted list of Chinook's air and water violations runs three pages. 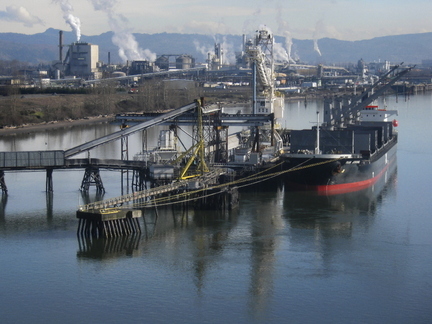 "Inspectors found Chinook storing waste materials outside without adequate pollution prevention controls, material being spilled during loading and unloading operations and being tracked throughout the site, and poor housekeeping on site and at the pier, all of which were potentially impacting stormwater runoff and water quality in the Columbia River," the notice said. Following that fine, Chinook applied for the appropriate permit, and that application is being reviewed. In the meantime, operations at the site continue. "They are operating completely illegally, and Ecology is allowing them to do that," said Brett VandenHeuvel, director of Columbia Riverkeeper, which filed the suit against Chinook last year. "And what happens when you do that is, you get spills," VandenHeuvel said. "And you're allowing them to undercut the other guys, those who are playing by the rules." Department of Ecology teams responding to the new spill determined by noon the material with the consistency of partially ground coffee beans floating on the Columbia was petroleum coke, said Jim Sachet, the department's spill manager for southwest Washington. But neither the department or the U.S. Coast Guard tried to clean up the material. They decided it would be impractical to do so and that the material was not causing any obvious harm to fish and wildlife. Community groups opposed to Chinook hope the spill focuses more attention from regulators on the site. "We're afraid that this spill of petcoke is just the beginning of more to come," said Jennifer Sargent, spokeswoman, for the group Cowlitz County Deserves Better.